For the most part, I have been watching from the sidelines, since I don’t teach math. I tinkered around with Atlas a bit and helped with the math curriculum. The site is fine. Atlas is built around Essential Questions, and Learning Standards, and Skills, and Resources. You can make direct connections to the new Massachusetts frameworks through a series of pull-down menus, which is handy. The math work has been relatively easy, since we have been using a pretty standardized math program with a strict curriculum flow. The ELA will be much trickier, since there is no ELA curriculum program, and meshing what I do with what my colleagues teaching the same grade level in the other schools in our district are doing is going to require a lot of finessing, and collaboration. I worry that we won’t be given to the time we need to do that kind of collaboration correctly. We’ll see. This past week, I finally dove into Atlas and began “mapping out” how I see my sixth grade ELA curriculum. I’ve mostly started my focus on literature and have been slowly fleshing out the ideas. I will say this: this kind of activity does make you think and reconsider the goals that you have in mind around lesson plans and unit development, and I struggled at times with coming up with Essential Questions (those overarching ideas) that are the foundation of the teaching. It’s been interesting, and I’m glad I finally started into it. You can even “test drive” Atlas yourself. The other day, I had my students type out a reading response on the computers, in part so that I could (again) remind them about how to leverage the tools of Microsoft Word (spelling, grammar, formatting) for their own writing. The response was to a standardized testing piece of reading (about siblings) and they had done a draft version the day before in their Writing Notebooks. On this day, they began to type and I was curious to see their skills at the keyboard. It wasn’t so great. Some students took almost 45 minutes to write a single paragraph. Most were hovering over their keyboards (ergonomic alert!) with a single finger jabbing at keys, their eyes darting from paper to computer. When I asked how many had ever used any kind of keyboarding system, only a few raised their hands. Most of the programs were online games. We don’t do our students any service by leaving out keyboarding from the school curriculum, and the ideal age is around second grade. I’ve talked about this with our principal on several occasions, and he agrees, but the money isn’t there to fit in a keyboarding class and the idea pales in comparison to the work we need to be doing around writing, reading and math (as evidence by our state scores). I try to make the point early and often, to students and parents, that keyboarding skills are helpful and for students with some writing challenges (particularly around spelling), it may open up doors to publishing that writing by hand won’t. And there it is, in the Common Core and our own Massachusetts Curriculum Frameworks. In fourth grade, students should be able to produce one full page of writing in a single sitting; in fifth grade, it is two pages; from sixth grade on up, it is three pages. If our work the other day is any indication, it would take hours for my students to type out three pages of original work. The question of why that standard is there is not quite obvious, but I suppose we can make the assumption that whatever assessment (PARCC or whatever) coming down the road will have some sort of extended writing pieces in which students will have to spend a considerable amount of time at their keyboard. Maybe even hours. Be ready for it! Earlier this fall, I saw a call by Bud Hunt to join a class at P2PU, which is a space for open courses. Bud’s class was centered around writing and the Common Core standards. I jumped at the chance not only to explore the Common Core with the writing focus, but also to figure out what a Massively Online Open Course (or MOOC) was all about. I found it fascinating that free courses are available, although what we also found is that while a lot of people join at the start, only a few make it to the end. It’s all driven by intrinsic motivation, by the desire to learn, and not because you paid a few hundred dollars to go to class. 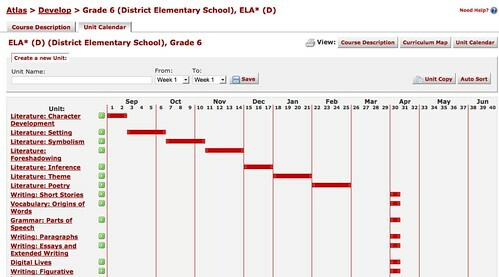 Bud structured the class with various entry paths — from discussions, and activities, and webinars each week. We also were tasked with designing a lesson plan or project, or redesigning an existing one, with the new frameworks in mind. (I did mine on an imaginary land brochure project. I’ll share that revamped lesson plan on another day). It was engaging work, picking apart the writing strand of the Common Core and then reflecting on what it is all about with other folks. We talked about the strengths (connections to technology, complexity of thinking, connections to content areas, etc.) and weaknesses (shift from narrative writing, etc.) I found the whole process of the course incredibly valuable as our state now has new curriculum standards based on the Common Core and our school district is revamping our curriculum to meet the new state standards. Also, our Western Massachusetts Writing Project is emerging as a leader in curriculum design around the Common Core in our region. One fascinating thing about P2PU is that anyone can start a course. If you go to their homepage, you can see the wide variety of offerings — from computer programming to writing poetry to learning how to draw. You could leverage that openness of the site for more online groups and classes, although the connection to graduate credits and professional development advancement is tenuous right now, and depends a lot on the state in which you live. Another interesting element is that all of the classes offered at P2PU, and at most MOOC sites, become “modules” that anyone can then borrow, adapt and re-use for their own purposes. Think about that. As time moves on, there will be entire databases of learning packets that organizations, such as the National Writing Project, might be able to use for online professional development, even as your own expertise gets meshed into the overall architecture of learning. I suppose there will be concerns about “ownership” of ideas and whatnot, but I think this is an interesting shift around learning possibilities. The other night, I joined some other teachers on Teachers Teaching Teachers to chat about MOOCs and the online learning experience. Here is the video of the chat we had, posted by TTT host Paul Allison. I have been trying to work for more content-area related connections to our mostly-daily writing prompts in class as part of our shift into Common Core writing, and of course, as they write, so do I (and so should you). One resource that has been making my life easier is the blog simply called Writing Prompts but which is completely made up of visual prompts. Many of them connect nicely with science, math and social studies. And most are very thought-provoking. It’s a wonderful site. On Friday, we used this one about earth as a science experiment, and it tied in with their recent work in science around the Scientific Method. We talked about what the alien might hypothesize, and then what kind of data collection it might do, and what conclusions it would discover. Then, they had a choice: they could create a fake science experiment write-up, a dialogue skit between the alien and a teacher, or a short story. I wrote this short story with them, using humor to tell my story. Of course, I did. I still have a vision of that flattened planet, all smooshed because Zingledoop had sat on it accidentally. We’d thrown that planet away into the intergalactic trash bin, just like the others. “Unless we do it first,” Zingledoop said, and we both laughed. We quickly got down to work. In some ways, we were old pros at this. 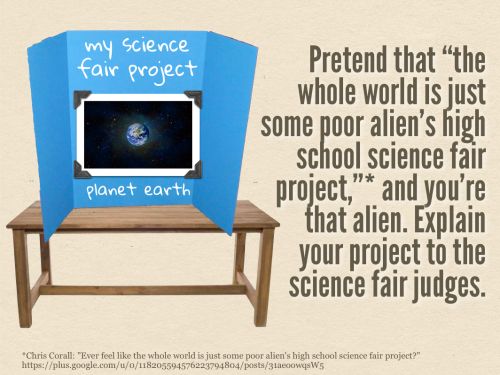 We’d created our fair share of planets and done plenty of intergalactic science experiments. With this planet, we decided that we would see what happens if we incrementally increased the planet temperatures. With ice caps and large oceans, the place would soon be flooded out. Or at least, that’s what we predicted. We’d be speeding up time to see if our prediction came true or not. “What’s this place to be called?” I asked. Zingledoop looked at the instructions. “Earth,” he answered. Yesterday afternoon, I spent the second of three planned afternoon PD sessions with colleagues in ELA, unpacking various elements of the new Massachusetts Curriculum Frameworks that reflect our state’s adoption of the Common Core Curriculum. Much of our inquiry yesterday was looking at the Guiding Principles, which form the underpinning of the entire document. Each of us was given a Guiding Principle to read and understand, and then we identified key words and phrases that captures the essence of our principle, which we then shared out to the larger group. I took notes and made this word cloud. Connections to families, the community and role models were a bit surprising to see as their own principle, and greatly appreciated by our group. There’s an important theme of the introduction of the Massachusetts ELA document that stresses that the frameworks are not designed to dictate how things are taught, but rather, what students should be expected to have learned by the time they graduate high school. We appreciated that kind of language, as if feels more like adults talking as opposed to autocratic finger-pointing. Sort of. ELA teachers are going to have to learn to teach new genres (scientific abstracts, “reading” data, understanding facets of historical documents, etc.) and shift the balance of fiction reading and fiction writing towards more informational text and expository/persuasive writing. We all wonder what the assessment will look like and how that will drive the way the new curriculum is used by school districts. While the new curriculum seems on the surface to have flexibility, the nature of the assessment (our state is part of the PARCC group) will play a huge role for many schools. There was a genuine worry that financial considerations and logistical considerations will shape the assessment, rather than educational and learning practice. While the Massachusetts curriculum acknowledges cultural and language diversity in its Guiding Principles, it seems like those principles get the back seat in the actual standards. This concerns our group, since one of our focus areas has been ways to support and nurture student voices. We talked about ways that a teacher could navigate through this minefield of language and expectations. It was pointed out that while we often talk of the importance of an educated populace built around the three concepts of a strong democracy, pursuit of personal goals, and employment, the focus of the Common Core around college and career-ready goals says a lot about who was working on the original document. While the Common Core may not be billed as a national curriculum, it sure is looking like it to us, and we noted that textbook companies are ramping up production of textbooks that tap into shared curriculum ideas among states, and we all know how often textbooks drive curriculum. That worries us, particularly if “canned curriculum” starts coming down the pike of Common Core. It was a great discussion and we used an article from NCTE called “Keeping Students at the Center of the Common Core Classroom” by Lorna Collier (it was published in The Council Chronicle in September) as a piece of shared reading that shows ways that teachers can use and adapt the Common Core while still focusing on students as individuals. It’s a good piece to read, if you haven’t done so yet. Over at one of the communities within the National Writing Project’s Connect, users are encouraged to upload audio thoughts about the Common Core curriculum and what it may mean for their teaching experiences. Since I am taking part in an online course around Common Core, it’s been on my mind a lot lately. A few weeks ago, I saw a link for an online course for educators wanting to learn more about the writing standards of the Common Core, which my state has fully adopted and is starting to roll out this year. In fact, our school district is in the midst of learning about Understanding by Design (backwards design), curriculum mapping and more as we begin to make the shift to the Massachusetts version of Common Core. I checked out the link and saw that my friend, Bud Hunt, was the facilitator (Check out his post about his dissertation thesis about school-based online writing and reading spaces. Very intriguing.) Yeah, I signed up. The other night, a bunch of folks in the Writing & Common Core: Deeper Learning for All course at P2PU (Peer to Peer University) gathered together in a Webinar to chat about expectations of the course, which runs about six weeks, and began some initial discussions around topics that are on our mind with the Common Core. These included: shifting towards more information/expository writing; writing across the content areas; the references to digital media; implementation at various states; and more. It was quite interesting and is an indication of some intriguing discussions to come. Our first assignment is an online annotation project, in which we are making comments and notes about the writing strands of the Common Core. This kind of activity is valuable, as it not only provides us with an incentive to read the Common Core deeply, but also to engage in some observations and discussions. Bud noted that most teachers don’t seem to have had a chance to really read the Common Core and spend time with it to understand it, and I agree. The annotation activity seems like a nice way in. My own interest is, of course, for my own classroom. I am already making shifts in what I have done and what I will be doing to reflect more of the new state curriculum. But I have another new motive, too. I have been asked to help facilitate some summer Professional Development session at a local university on implementing the new Massachusetts ELA standards, and in order to do that, I need to have a deeper understanding of the curriculum expectations. So, I’m diving in, but I am not alone. I’m grateful for the chance to be part of the P2PU Common Core group, and to learn from them and with them. And having Bud as a guide is a great start.